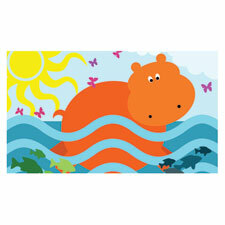 Brighten your day with a happy swimming hippo magnet on your fridge. The 2" x 3" magnet is professionally printed on a flat magnetic backing. Our collection of magnets make charming gifts for friends or coworkers. Tuck one into a holiday stocking or add it to your refrigerator collection!